Purpose: Use this document as a reference for running 3C engine. The 3C engine process must be run or scheduled for the 3C item to be assigned to the user, unless the item is assigned manually to an individual user. On the 3C Engine Parameters tab, select the Process 3C’s parameters. Population Selection - Will allow you to use tools like a query to select your student population. Trigger Table - This selection requires the user to setup of a 3C Engine Trigger, please review QRGs for that process. Mass Change - This selection requires the setup of a Mass Change definition, please review QRGs for that process. *Note: After selecting options under Process 3Cs, additional options become available. For additional assistance in determining what data and tools to select, contact an administrator. 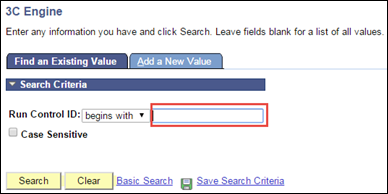 On the 3C Engine Parameters tab, select the Process Join Records selection. PeopleSoft Campus Solutions enables you to communicate jointly with individuals at a common address rather than producing separate communications for each individual. For example, you can invite a married couple or two roommates to an event by sending a single invitation to their joint address. No: Select this option if you do not want to apply joint communication rules to this process. Yes, All Joint IDs: Select this option to apply joint communication rules and include all communications set to enable joint communications. 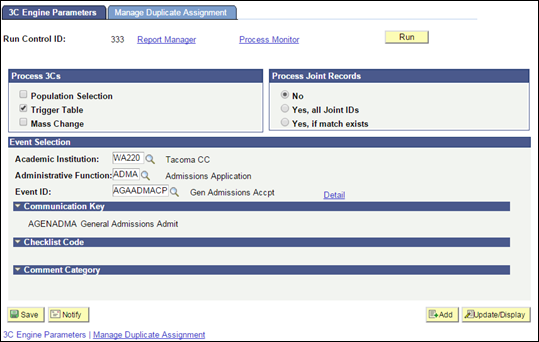 Click the Manage Duplicate Assignment tab. This page is used to prevent duplicate checklists and communications from being assigned. For Communications processes, select the Check Duplicate Communication box. 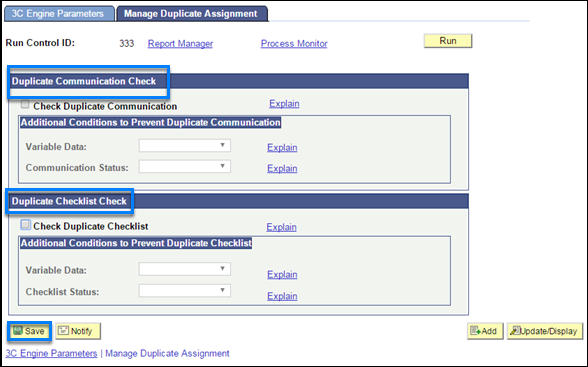 For Checklist processes, select the Check Duplicate Checklist box. 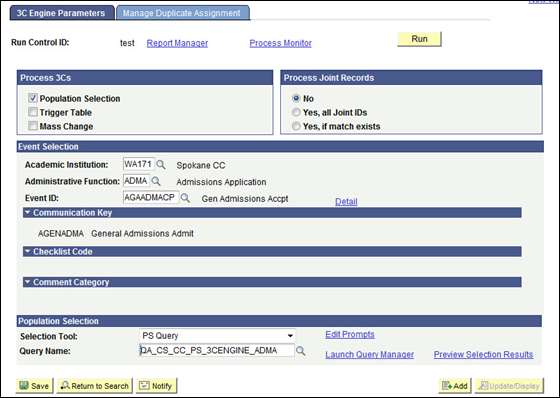 Click the OK button on the Process Scheduler Request page. The Process Number should be at the top of the page. Click the Refresh button until Run Status is "Success" and Distribution Status is "Posted." Validate data by reviewing individual student’s 3C data as assigned by population. This QRG should direct to the link to the next step to Communication Generation or Letter generation so we could know the next step to do as the process do not actually stop at this QRG. Thank you for the information! The Training Team will share the information you have provided for accurate updates and linking of additional materials.